An accomplished public speaker with a great message: People can change their own lives! Gai Foskett is a Master Certified Coach who has delivered over 4,000 hours of one-on-one coaching internationally with high level executives, business owners, managers and individuals. Each year Gai has a number of speaking engagements where she talks about success stories, coaching, motivational messages, managing others happily, creating balance. It is an opportunity for people to listen and have some fun as well as begin to understand the tools to create change for themselves. 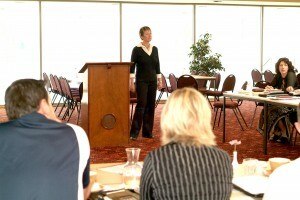 Contact Gai Foskett, Motivational Speaker today to book a speaker who helps people change their lives.